These points are only known through study, and do not seem to be intuitively understood. Prof. Park, Jae Woo, by showing us the standard correspondence system, provided a leap in our consciousness. How simple it is to see that the body is represented on the hands in correspondences that are in the same proportions and positions as the body. Once we understand the standard system, it is clear to anyone, with any level of education, that the hands are a remote control for the body. Now the way is open for us to understand the Insect System, the mini system, and all the other complete and partial correspondence systems that Creator spirit has provided us with. Taking the standard and insect correspondence systems, there are at least 44 correspondence points of each part of the body and each organ in the hands and feet. When we add the other systems or ‘maps’, there are many more. In other words, to reach one organ, we can find 44+ remote control points that can help heal it, without touching the actual organ itself. A correspondence point is thus a remote control system, and it stimulation can thus do no harm to the body. 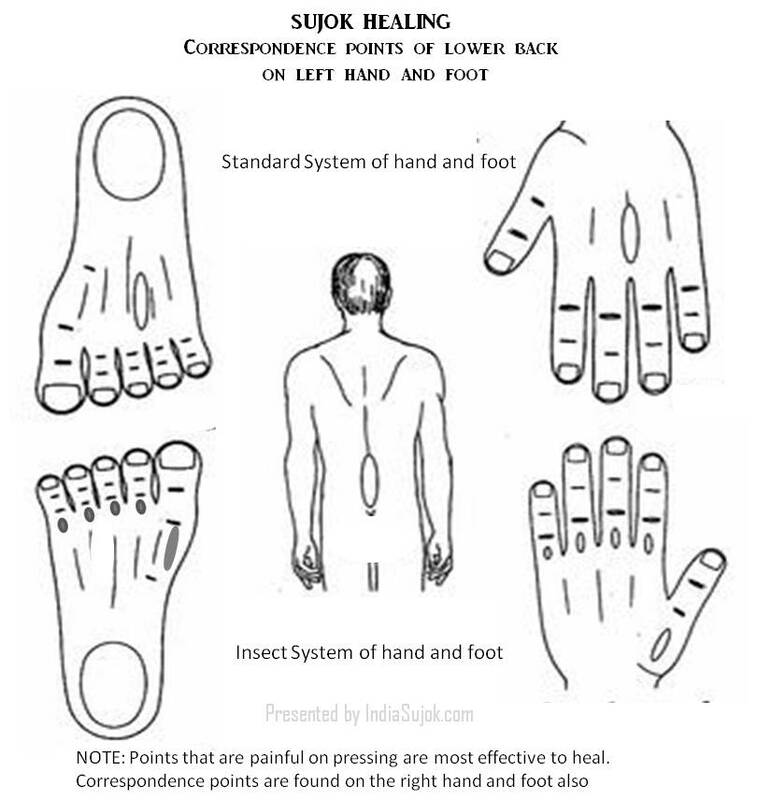 Image shows different correspondence points for the lower back in the left hand and foot in two systems – Standard and Insect. In case of lower back pain or other issue, find the point that is painful on pressing, and stimulate for healing. a close similarity, connection, or equivalence. Since the hand is so similar to the body, there is a connection. We can find the organs of the body on the hands, in the same position as on the body. communication by exchanging letters with someone. We can think of the points of correspondence as friends of an organ.When something is wrong, the organ sends emails [waves] to all its friends [correspondence points].Some of them ‘open’ the email and others do not.If you want to know what the organ is communicating, go to the friend that opened the email. In other words, the correspondence point/s that pains on pressing, is the one that has the closest connection at that point of time with the dis-eased organ. This is/are the treatment points. When they are stimulated, the organ will receive the curative waves, and begin to heal. Our own behavior is not unlike the behavior of our correspondence points! Another gift of the Existence Spirit. Thanks to Professor Park Jae Woo who brought this to our attention. 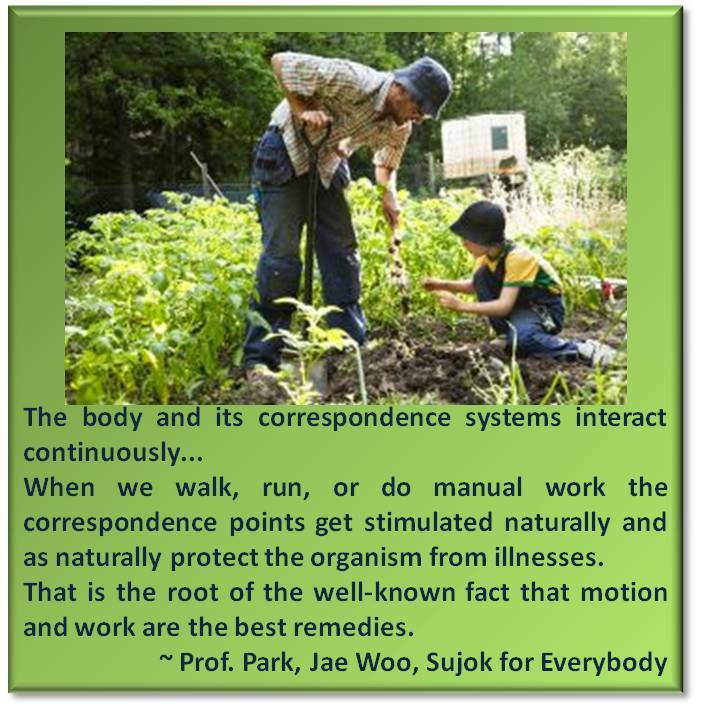 Teachings of the Master, Professor Park Jae Woo, as understood by Meenakshi Suri. As consciousness expands, so may this page! ©2014 Meenakshi Suri. Share, but with all information including this copyright notice intact.